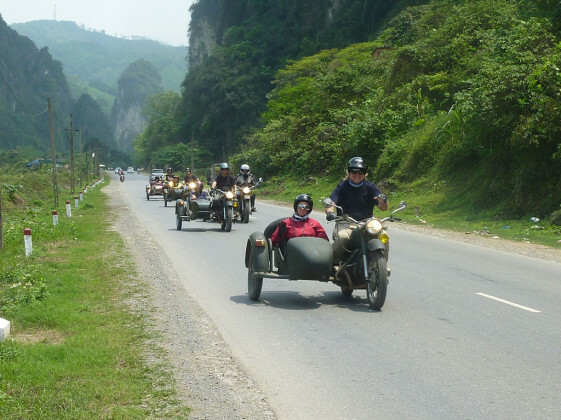  Ride through Vietnam’s beautiful northern mountains for a great cause. Held annually in Vietnam, Rally Indochina is the largest annual charity motorbike ride in South East Asia. Open to any adventurer with a desire to put something back into Vietnam, 500 USD of the Rally entry fee is directly donated by the rider to the Blue Dragon Children’s Foundation. Blue Dragon uses these funds to fight against child trafficking from the central coast and northern mountains into illegal sweatshops in Ho Chi Minh City. Over nine days, ride classic, Soviet-era motorcycles through spectacular mountainous countryside, past verdant rice fields, grazing buffaloes and dramatic, jungle-clad, limestone karst mountains straight out of Apocalypse Now. Enjoy the friendship of countryside folk, the comradeship from other riders, the delights of Vietnam’s excellent food and the comfort of well appointed hotels. While on Rally Indochina, visit various fields of battle from both sides of the Vietnam War. Unravel the complexities of the conflict and contribute directly to charitable efforts to designed to improve the lives of children living in the former war zones. The rally includes visits to the children of the Foundation and takes in exploration of the ethnic tribe mountain areas. All money raised goes directly to the Foundation. Over the past few years, more than 100 participating motorcyclists from around the world have raised more than US$255,000, a large part of which goes to fight child and women trafficking. Each year the goal is to raise more funds than before, so the greater the number of participants, the better. Challenge yourself. A once in a lifetime experience!